As you shop for an engagement ring or wedding band, it can be helpful to understand the difference between CZ and diamond jewelry. Although it was first discovered in the late 1800s, cubic zirconia (CZ) has only been used in jewelry production since 1976. In the subsequent decades, it has become the most popular diamond substitute on the market. Today, CZ is used in engagement rings, wedding bands, and many other types of jewelry. To the naked eye, it is virtually indistinguishable from a natural diamond. CZ and diamonds can both be colorless, or they can be tinted with yellow, pink, blue, or another tone. Diamonds and CZ are both cut in a variety of traditional shapes, which enhance the light refraction of both stones. Although cubic zirconia is not as hard as diamond, it is very durable. Both stones make good centerpieces for rings you intend to wear for many years. Perhaps the most significant difference between the two stones is the price. Depending on its clarity, color, cut, and carat, a diamond can cost many thousands of dollars. A quality CZ, on the other hand, may cost less than $200. Since cubic zirconia is lab-created, it is flawless. Almost all natural diamonds have some type of flaw, even if this flaw is a very minor inclusion or feathering pattern deep within the stone. Diamonds are the hardest material known to man. While CZ is quite durable, about the same as a sapphire or ruby, it is not as hard as a diamond. Because of the material's structure, CZ sparkles more obviously than a diamond. Jewelers and gem experts refer to this quality as the stone's "fire." Cubic zirconia is denser than diamond, which means a one-carat diamond is physically larger than a one-carat CZ. Colorless diamonds are very rare and are among the most valuable gems. However, color must be intentionally added to CZ to make it appear more natural. This imitation diamond is usually perfectly colorless. What is your budget? Since CZ is much more affordable than diamonds, the price difference may be a major factor in your decision. 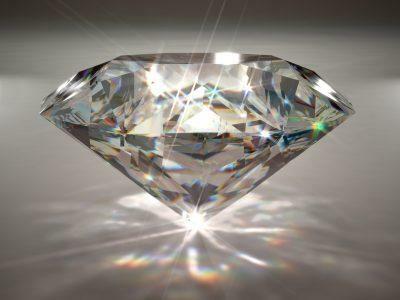 Would you rather have a small, flawed diamond or a large, flawless cubic zirconia? How hard will you be on your ring? If you work with your hands or tend to be rough on jewelry, the difference in durability might be a factor in your decision. Both stones can withstand quite a bit of use and abuse, but this is something to keep in mind. How do you want others to view your ring? If you are concerned about people noticing your ring features CZ, you might want to choose a genuine diamond or a CZ stone with less fire and a little color. You also might consider a smaller stone. Regardless of which stone you choose for your engagement ring, the difference between CZ and diamond is really only apparent to trained jewelers or those who look very carefully. If you're wondering whether your ring features a fake diamond, you might consider having it appraised by a jeweler you trust. This is the only sure-fire way to identify the gem.